Strategic planning is an organizational management activity that is used to set priorities, focus energy and resources, strengthen operations, ensure that employees and other stakeholders are working toward common goals, establish agreement around intended outcomes/results, and assess and adjust the organization’s direction in response to a changing environment. It is a disciplined effort that produces fundamental decisions and actions that shape and guide what an organization is, who it serves, what it does, and why it does it, with a focus on the future. Effective strategic planning articulates not only where an organization is going and the actions needed to make progress, but also how it will know if it is successful. A strategic plan is a document used to communicate with the organization the organizations goals, the actions needed to achieve those goals and all of the other critical elements developed during the planning exercise. What is Strategic Management? What is Strategy Execution? Strategic management is the comprehensive collection of ongoing activities and processes that organizations use to systematically coordinate and align resources and actions with mission, vision and strategy throughout an organization. Strategic management activities transform the static plan into a system that provides strategic performance feedback to decision making and enables the plan to evolve and grow as requirements and other circumstances change. Strategy Execution is basically synonymous with Strategy Management and amounts to the systematic implementation of a strategy. What Are the Steps in Strategic Planning & Management? There are many different frameworks and methodologies for strategic planning and management. While there are no absolute rules regarding the right framework, most follow a similar pattern and have common attributes. Many frameworks cycle through some variation on some very basic phases: 1) analysis or assessment, where an understanding of the current internal and external environments is developed, 2) strategy formulation, where high level strategy is developed and a basic organization level strategic plan is documented 3) strategy execution, where the high level plan is translated into more operational planning and action items, and 4) evaluation or sustainment / management phase, where ongoing refinement and evaluation of performance, culture, communications, data reporting, and other strategic management issues occurs. What Are the Attributes of a Good Planning Framework? 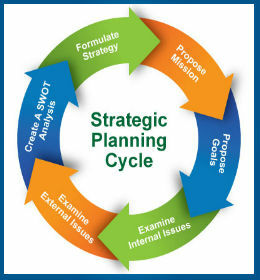 The Association for Strategic Planning (ASP), a U.S.-based, non-profit professional association dedicated to advancing thought and practice in strategy development and deployment, has developed a Lead-Think-Plan-Act rubric and accompanying Body of Knowledge to capture and disseminate best practice in the field of strategic planning and management. ASP has also developed criteria for assessing strategic planning and management frameworks against the Body of Knowledge. There are numerous strategic planning and management frameworks that meet these criteria, such as the Balanced Scorecard Institute’s Nine Steps to Success. For more information about the criteria, please visit the ASP website. For more information about strategic planning and management in general or for about how Balanced Scorecard Institute can help you, please consider our certification or consulting services, or contact us directly. We are a results driven Adverting Agency with a proven track record of achieving our clients objectives. All Right Reserved by: 1st Adtube Limited UK Reg No:10516561.